Being Erin ★ : It’s been a very spiritual day. It’s been a very spiritual day. This morning I went to the Mind-Body-Soul Exhibit and got two aura photos taken! I'm a very spiritual person and have always wondered what my aura was. My friend Simone's was beautifully blue and green; she's a very chilled out person so it felt accurate. I got the photos done by two different people; Jann Morgan and Jo from Avalon by Nature. Last time I was in Newcastle I wanted to go and get an aura photo from Jo but unfortunately they were closed the one day I was able to go. Luckily she let me know that she would be at this event today and I knew I had to go. I've been curious about my aura for years; I've always wondered what it would be like. My mum and I were having a conversation in the car the other day about auras and the colours we thought we would be. Blue has always been my favourite colour and red has always been my least favourite, however I was saying to her that I feel like around my head that I am red at the moment due to anger and frustration I am feeling towards my working life. When I saw the first photo I laughed. It was hilarious to me that I was correct about what colour mine would be, however I was a bit disappointed that it wasn't a rainbow of colours and I was incredibly surprised there was no blue at all. However, Jann explained that red is an active and creative colour and that I am able to tap into others colours as they're with me all the time, but I am projecting red at the moment which did make a lot of sense. 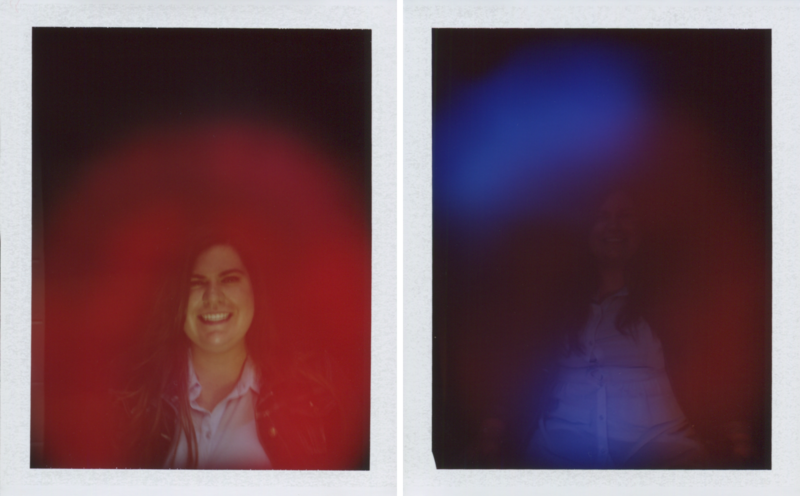 The second photo by Jo is more-so what I thought my aura would look like once I accepted that red would be there. A combination of the creativity and active nature of red, along with the calming and intuitive nature of blue. Jo informed me that the black surrounding area of my aura is my protective shield that I have up to keep bad things out. I've read that auras can expand pretty far; up to metres away from your body, however I've always felt that I was not expansive in that way and have always felt very to myself and somewhat alone in the world (not lonely, but alone). That's not a bad or sad thing, just my truth. While I was there I also picked up The Wild Unknown Tarot Deck. I have been eyeing it for awhile online as the imagery is just beautiful and when I saw it there I knew I had to pick it up. I also picked up a White Sage smudge stick which helps to cleanse the house of spirits. If you're at all interested in spirituality or want to learn more about it I wholeheartedly recommend attending any expos in your area; they tend to happen every month or two and it's great to connect with people who have such a passion and belief in the same thing as you. It's great to learn as everyone has their own experiences and knowledge to share. This looks truly beautiful! I never thought about getting my aura read, hmm. that's food for thought.